Plants store compounds that supplement external resources to maintain primary functions. We reviewed the role of stored non-structural carbohydrates (NSC) and nitrogen (N) in juvenile woody species for spring growth and cold and drought stress tolerance, which are crucial processes for early performance of forest plantations. Plant functional types differed in NSC and N partitioning and allocation to new growth. In general, however, new leaves/shoots were more enriched in remobilized resources than new fine roots. Conifers used less remobilized resources than broadleaf species for fine root growth. 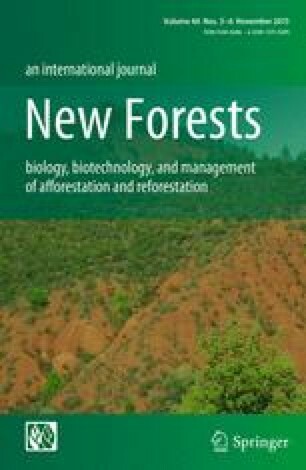 New shoots/leaves were mostly comprised of remobilized N (>60 %) in conifers and broadleaf deciduous species, while broadleaf evergreens relied more on soil N (<50 % remobilized N). In contrast, few differences among functional groups existed in the contribution of remobilized carbon (C) to new leaves/shoots, which comprised 28–45 % of stored C reflecting the importance of current photosynthesis and distinctions in C and N remobilization physiology. The amount of N remobilized by an organ was positively related to its contribution to seedling N content. However, leaves are priority N sources in evergreens, which remobilized more N than predicted by their contribution to seedling N content. In contrast, roots in broadleaf evergreens and conifers were poor contributors of remobilized N. Under low stress, spring growth has little effect on NSC reserves. However, prolonged and intense photosynthesis depression strongly reduces NSC. In contrast, N reserves usually decline after planting and their replenishment takes longer than for NSC reserves. Strong storage reduction can hinder seedling stress acclimation and survival capacity. Resource storage can be promoted in the nursery by arresting plant growth and supplying resources at a higher rate than seedling growth and maintenance rate. We conclude that the way in which woody plants manage stored resources drives their growth and stress tolerance. However, plant functional types differ in storage physiology, which should be considered in silvicultural management. The online version of this article (doi: 10.1007/s11056-015-9499-z) contains supplementary material, which is available to authorized users. This research was supported by funds of Projects AGL2011-24296 (ECOLPIN) and CGL2014-53308-P (SERAVI) of the Spanish Ministry of Science and Innovation, Remedinal 3 (S2013/MAE-2719), of the Community of Madrid, and CCG2014/BIO-004 of the University of Alcalá.